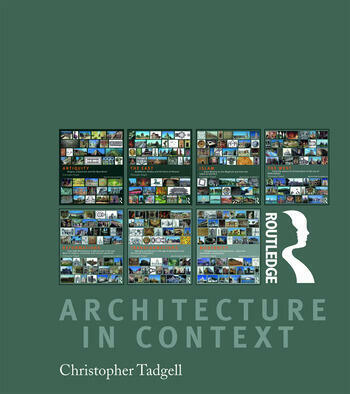 Architecture in Context is a series of seven books describing and illustrating all the seminal traditions of architecture from the earliest settlements in the Euphrates and Jordan valleys to the stylistically and technologically sophisticated buildings of the second half of the twentieth century. It brings together the fruits of the author’s lifetime of teaching and travelling the world, seeing and photographing buildings in an extraordinary synthesis. Each stand-alone volume sets the buildings described and illustrated within their political, technological, social and cultural contexts, exploring architecture not only as the development of form but as an expression of the civilization within which it evolved. The series focuses on the story of the Classical tradition from its origins in Mesopotamia and Egypt, through its realization in ancient Greece and Rome, to the Renaissance, Neo-Classicism, Eclecticism and Modernism. This thread is supplemented with detailed excursions to cover the development of architecture in Central America, India, South-East Asia, and the Islamic world. For students of architecture and art history, for travellers, and for readers who want to understand the genesis of the buildings they see around them, each volume provides a complete, readable and superbly illustrated reference. The first in this series of seven books, it describes the origins of the Classical tradition in the mountain temples of Sumer, the pyramids of Egypt and the ziggurats of Mesopotamia. The East describes and illustrates the seminal architectural traditions of the world, is a survey of unparalleled range and depth and also provides their political, technological, social and cultural contexts. The architecture of Islam comprises a high proportion of the world’s most beautiful buildings, from perhaps the most perfect images of the lost Eden in the gardens of the Alhambra, to the built expression of the boundless expansion of the faith to be seen in the mosques of Ottoman Istanbul. This volume tells the story of European architecture in the ‘middle ages’ – from the destruction by northern barbarians of Rome and the urban society it had fostered to the rediscovery of Classical values and the rebirth of humanism in 15th-century Italy. This fifth volume traces the rediscovery of Classical ideas and the emergence of the great artists and architects of late-15th- and early 16th-century Italy that led to the cultural peak characterized as the High Renaissance. Like its companion volume on the High Renaissance, Mannerism – this sixth volume traces the development of architecture and decoration in the 17th and early 18th centuries – particularly the transformation of rationalist Classical ideals into the emotive, highly theatrical style known as Baroque. Modernity is a comprehensive survey of European architecture from the pre-dawn of the Enlightenment in early Georgian England; to the triumph of Brutalism in the seventh decade of the twentieth century; on to a sketch of major trends building up to the turn of the millennium. Christopher Tadgell taught architectural history for almost thirty years before devoting himself full-time to writing and research, travelling the world to see and photograph buildings from every tradition and period. Born in Sydney, he studied art history at the Courtauld Institute in London. In 1974 he was awarded his PhD for a thesis on the Neoclassical architectural theorist, Ange-Jacques Gabriel. He subsequently taught in London and at the Kent Institute of Art and Design in Canterbury, with interludes as F.L. Morgan Professor of Architectural Design at the University of Louisville and as a Member of the Institute for Advanced Study, Princeton. He has lectured at academic institutions around the world, including the universities of Princeton, Harvard, Columbia and Cornell, the Graham Foundation in Chicago, and Cambridge University and the Courtauld Institute in the UK. He is a Trustee of the World Monuments Fund, a Fellow of the Society of Antiquaries and a member of both the British and American Societies of Architectural Historians. His The History of Architecture in India (1990, several reprints, Phaidon) is the definitive one-volume account of the architecture of the subcontinent, while many publications on French architecture include the standard account in Baroque and Rococo Architecture and Decoration (ed. Blunt, 1978, Elek). He has contributed many articles on Indian and French architecture to The Grove Dictionary of Art and other major reference books.